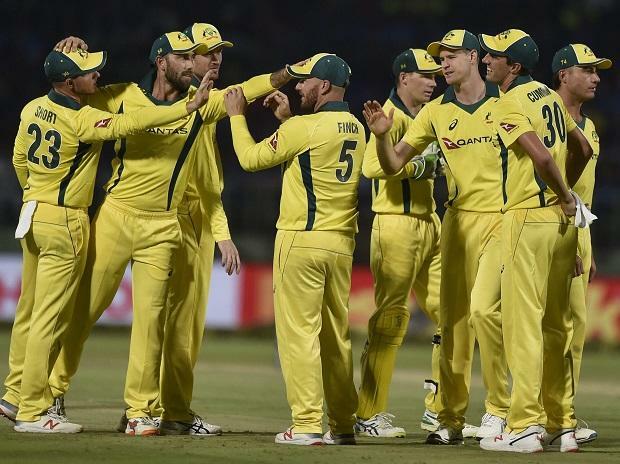 A profligate Umesh Yadav undid all the good work done by Jasprit Bumrah as Australia edged out India by three wickets in a last-ball thriller in the first T20 International at Dr Y S Rajasekhara Reddy ACA-VDCA Cricket Stadium in Visakhapatnam on Sunday. With 14 required off the last over, Umesh was hit for a boundary each by Jhye Richardson and Pat Cummins, who had identical scores of 7 not out as they reached the target of 127 off the last delivery of the match. This was after Japrit Bumrah (3/16 in 4 overs) bowled an incredible 19th over to bring India back in the match just when it was looking that Australia would canter home. He got Peter Handscomb with a short ball and then yorked Nathan Coulter-Nile after having dismissed Aaron Finch in his first spell. However, it was Australia;'s tail-enders, who held the nerve getting the couple required couple of runs off the final delivery of the innings. Earlier, Opener KL Rahul's scored a stylish half-century on comeback but an inexplicable batting collapse found India restricted to a paltry 126 for 7 by Australia in the opening T20 international. Back in the senior team after two-month wilderness due to his trash talk on a TV show, Rahul showed why he is rated highly during his 36-ball-50 but some indiscreet shot selection from his teammates meant that only 46 runs were scored in the back 10. Mahendra Singh Dhoni, played one of his signature dogged innings as he stemmed the rot with an unbeaten 29 off 37 balls but the total was definitely sub-par in the end. The best partnership was 55 for the second wicket between Rahul and skipper Virat Kohli (24, 17 balls). Looking in his element, Kohli didn't get the required elevation as he stepped out to leg-spinner Adam Zampa only to find Nathan Coulter-Nile at long-on. In the very next over, Rishabh Pant misjudged a single and Jason Behrendorff dived to his left and released the ball quickly for keeper Peter Handscomb to effect a run-out. The Indian innings was all about Rahul's flair as he repeatedly played the inside out lofted shot off pacers and the only six was a down the ground hit off Adam Zampa. Rahul however could not convert his start and got out immediately after reaching his fifty in an over where Coulter-Nile (3/26) also breached Dinesh Karthik's defence with an off-cutter. But things started to go in India's favour from the next over with Rahul and then Kohli scoring a flurry of boundaries. India's wrist spin duo of Yuzvendra Chahal (1/28 in 4 overs) and debutant Mayank Markande (0/31 in 4 overs) couldn't much of make an impact on Maxwell, who blasted both of them for towering sixes. But things changed when Chahal finally got Maxwell with a flighted delivery wide outside the off-stump and the batsman failed to clear Rahul at long-off. Short was run-out after a mix-up with Peter Handscomb and after Ashton Turner was removed by Krunal Pandya, Australia were in a spot of bother at 102 for 5. But Richardson and Cummins kept their calm to give Australia a 1-0 lead going into the second and final game in Bengaluru on February 27. Put into bat, opener Rahul's half-century on comeback but an inexplicable batting collapse found India restricted to a paltry 126 for 7 in 20 overs. Back in the senior team after two-month wilderness due to his trash talk on a TV show, Rahul showed why he is rated highly during his 36-ball-50 but some indiscreet shot selection from his teammates meant that only 46 runs were scored in the back 10.